There’s no denying that the cannabis industry is a booming market. 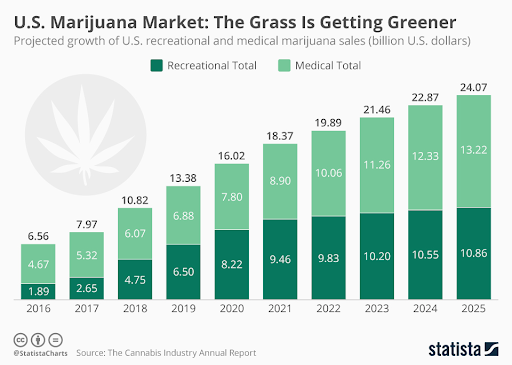 Projected growth of sales in both the recreational and medical market in the United States alone is expected to reach over $13 billion in 2019. Even further, this number is anticipated to almost double by the year 2025, reaching as high as $24 billion as legislation continues to relax as we see more and more states beginning to open their arms to the market. The truth remains however, that advertising in the niche still presents a significant amount of obstacles due to the fact that the status of cannabis still remains illegal under federal law. So, what can cannabis businesses do to ensure their sustainability and position themselves favorably in this budding industry (pun intended)? If you’re interested in learning more on various options you have available to help spread awareness about your business, then you’re in luck, because we’ve created a list of the best strategies you can use to get the word out during these tricky times. Traditional channels for marketing are fairly limited considering the “grey market” status of the cannabis industry. Most traditional options for marketing explicitly ban the advertisement of recreational use and cannabis-related products. As a result, it’s imperative that cannabis businesses maintain a strong focus on cultivating business organically first and foremost. The good news when it comes to advertising is that there is a loophole of sorts. 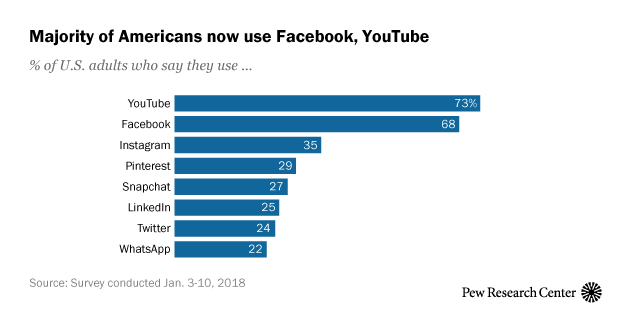 By adopting an educational approach, many businesses are able to circumvent the traditional barriers associated with traditional advertising channels. Define your mission and vision accordingly and structure your content and strategy around these two principles. Focus on creating content with the purpose of educating consumers and eliminating the various stigmas associated with cannabis use. By taking an organic and academic approach to your efforts, you can better position yourself for success in your advertising efforts. A main pain point in advertising in the cannabis industry is the level of inconsistency in regulation from state-to-sate. 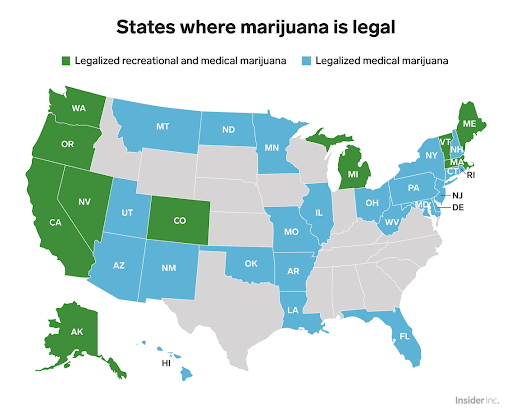 As of 2019, medical use of marijuana is legal in 33 states, with recreational use being legalized in 10 — which makes advertising online particularly tricky. However, a great industry resource for in-depth research on the matter is the FootTraffik’s state-by-state guide on cannabis advertising regulations. The list includes excerpts of legislation and state-specific code that has been implemented for reference in advertising practices and is particularly useful to those with brick-and-mortar operations or those interested in hitting the pavement locally. The best approach to take when it comes to developing your marketing strategy is to first familiarize yourself with the various opportunities available to you. For instance, there are opportunities for sponsorship, partnership with other brands as well as various options for print, digital marketing and social media advertising. Decide which channels you would like to focus on first. However, keep in mind that your resources are limited, so it’s of paramount importance that you begin by focusing on one or a few specific channels to start with. This will give you the ability to develop insight into the effectiveness of your strategies and will ensure that your efforts achieve the greatest impact by spreading yourself too thin across multiple channels. Once this is finished, begin compiling a list of the various outlets and platforms that you can target within these channels. This approach will ensure that your efforts remain well-organized and strategic throughout the entire process. Print media is far from dead and it’s well-worth the investment for businesses in the cannabis industry. Think of print media you can distribute in your local area. Business cards are of course an essential tool and you can additionally identify various local outlets and see if you can strike an arrangement with displaying them on their counters, for example. Informational catalogues and flyers are also great pieces to have for distributing at local venues, businesses or events. Keep in mind that you don’t necessarily have to focus on cannabis-specific options. Think outside of the box — what are your consumers’ interests? Alcohol, food and beverage or natural products are great markets to tap into that can also present a wide array of opportunity for your business. While you can’t exactly purchase ad space in your local New York Times magazine, you can target industry-specific, alternative or non-mainstream publications, as they often do not place the same limitations on their advertising partners as more mainstream and traditional ones do. Keep in mind that targeting magazines as opposed to newsprint is a more effective strategy due to the fact that they simply have a longer shelf life. News content quickly becomes stale, but glossy magazines in dispensary or business waiting rooms can have a shelf life of months. Looking for a great resources for popular cannabis publications and magazines? Ganjapreneur has an extensive list that cannabis businesses can use to begin their research efforts. Developing a website and blog to position and establish your brand in the online space is going to be crucial to your success. Did you know that businesses who prioritize blogging are 13x more likely to see a positive ROI from their efforts? Furthermore, a recent study found that companies who blog receive on average 97% more links to their website than those who don’t. 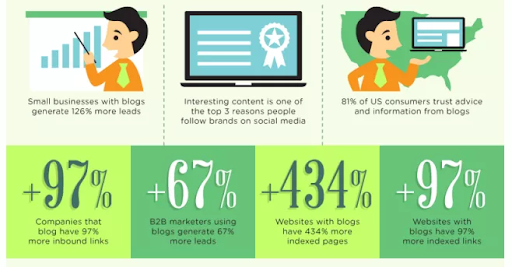 Blogging not only helps to establish your presence in the industry organically, it promotes awareness, is a great tool for lead generation, can enable you to position yourself as an influencer in the industry and is crucial for boosting SEO. Google gets over over 100 billion searches per month — ensuring your content is search-engine optimized is crucial to leveraging this traffic and the more you blog, the more chances Google’s algorithm has to search and index your content. SEO leads have a 14% close rate — that’s over 8x more than closing rates from leads you’ll generate with traditional tactics such as direct mail or print, which have a 1.7% close rate. There’s absolutely no reason why any cannabis business shouldn’t take full advantage of this impactful marketing strategy. Getting your cannabis business registered with key outlets is a great option to increase your exposure to online audiences. If you’re a brick-and-mortar business, registering with Google My Business will give your company exposure to audiences searching for your business specifically, or other businesses similar to yours. There are also several industry-specific online directories you can target to register with. Leafly.com is an industry leader which gains as many as 13 million views per month. Weedmaps.com is also a very popular resource for consumers in the cannabis industry that businesses can leverage to gain greater exposure. Guest posting is a great tool cannabis businesses can use to help build their credibility, subscriber base and establish an authoritative presence in the industry. 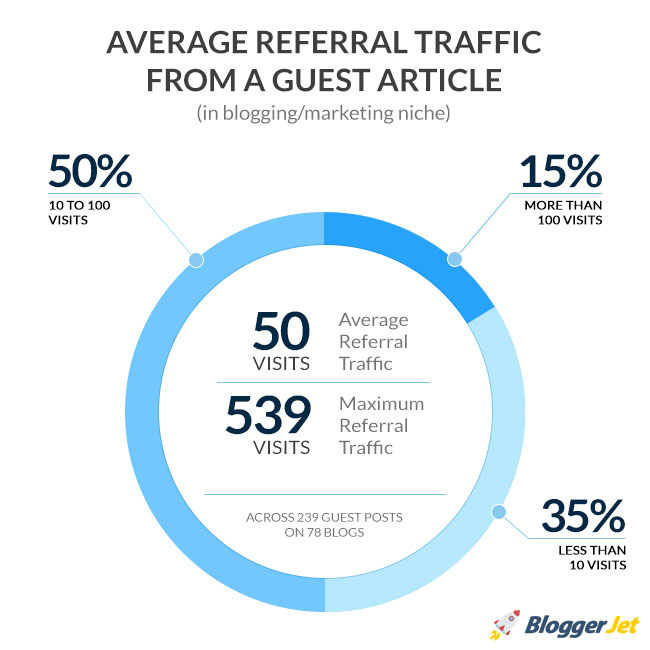 Through guest posting you can leverage the influence and audiences of other platforms and redirect that traffic back to your website, products or subscriber sign-up. Fortunately, there are a plethora of industry-specific platforms online that you can choose from which allow guest posts to their website. Did you know that the return on investment for email marketing is greater than other forms of traditional marketing? 2019 research found that for every $1 a business invested in email marketing, they received an average of $38 in return. 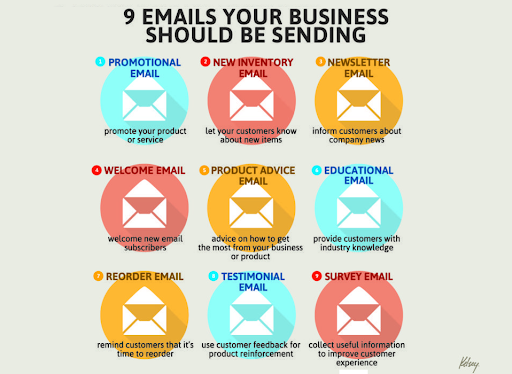 Email gives you a direct line to your consumers and is an excellent way to generate leads. 73% of millennials still would rather communicate business affairs via email and 28% of customers say they prefer to receive promotional content via email more than once a week. Furthermore, 30% of customers make purchases from brands they subscribe to and they are additionally 3x more likely to recommend your brand to others. 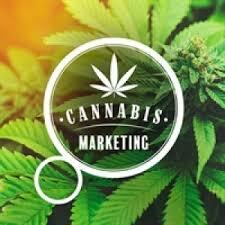 However, it’s important to note that many email marketing platforms have ambiguous regulations regarding advertising cannabis-related products due to its current federal status and most will be keeping an eye on the locations of your contacts to ensure that their service is complying with state regulation. As a result, investing in traditional platforms such as ConstantContact and ActiveCampaign can be hit or miss as they reserve the right to suspend your campaigns without notice. Instead, focus on industry-specific tools and platforms. One popular example is Cannabiz Media. Cannabis businesses can subscribe to an extensive licensing database through them and leverage the company’s email marketing and CRM tools to ensure they make the most efficient use of their resources. There’s no denying the fact that digital advertising presents significant challenges to businesses in the cannabis industry. Google Adwords in particular is known for being extremely stringent in their efforts to curb any cannabis related advertising content as it’s specifically prohibited in their advertising policies. Use of the terms “marijuana”, “cannabis”, “cbd” and even terms such as “canna” are flagged for removal. If you’re lucky, you may be able to slip through the cracks by avoiding the use of prohibited terms and being particularly crafty with your content — but the truth remains you’re living on borrowed time. A better focus in your advertising efforts is to direct your digital advertising to industry-specific options. Platforms such as TrafficRoots and Mantis provide a global network of advertising options to cannabis businesses in multiple formats and are a much more effective use of your time. Social media is another tricky area for businesses operating in the cannabis industry. When it comes to advertising, you’re pretty much out of luck, as platforms such as Facebook, LinkedIn, Twitter, Pinterest, Instagram and YouTube all have strict policies against advertising cannabis use or anything related to the industry. However, that doesn’t mean you should forego exposing your brand to its 3 billion strong audience it altogether. While these platforms do indeed prohibit advertising, they don’t prohibit the creation of organic content. As a result, strategically establishing your presence on various social media platforms is an effective marketing strategy for any cannabis business. Create a Facebook page with your company’s information and create, share or compile content related to the industry. Pinterest is a great option if your brand has appeal to a female audiences and Instagram is an extremely popular option due to the fact that it’s founded on visually-rich content. Additionally, LinkedIn is a great platform for posting business updates, job opportunities or connecting with businesses in the industry for further opportunity. Identifying potential sponsorship opportunities in and outside of the cannabis industry is a great way to spread awareness about your brand and generate new leads. The opportunities are endless and can include online platforms such as Leafly (you can sponsor content), as well as local business venues and events. For example, the annual Cannabis Conference offers their sponsors tremendous market exposure and the ability to connect with industry influentials. There are also tons of trade shows and cannabis-related events around the nation that occur as a regular basis and are popular within the community. Cresco Labs, a Chicago-based medical marijuana cultivator and processor created a “swag bag” for Chicago Marathon runners which included a “Welcome to a State of Relief” brochure that “provided information about the Illinois medical marijuana program. Founder and CEO Charles Bachtall commented on the approach by saying, “We wanted it to be very visible and in an environment where it might have been unexpected”. The company saw a noticeable bump in website traffic and brand awareness as a result. The cannabis industry is a rapidly growing market where businesses are constantly struggling to maintain a distinct voice and evolve in a constantly changing environment. 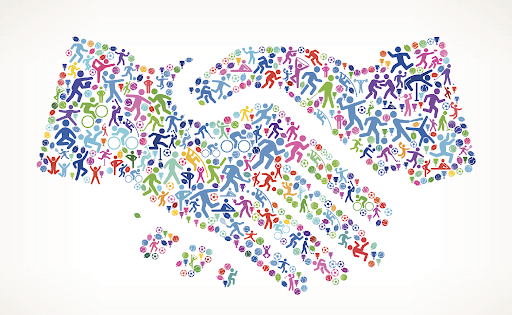 While many traditional marketing opportunities are limited due to the grey nature of the industry, there still remains a plethora of resources and opportunity available to those looking to position themself favorably and spread awareness about their company. Leverage the information provided in this guide to market your cannabis business effectively and make the best use of the resources you have available. What are some creative strategies you’ve seen businesses use to market themselves in the industry? Let us know in the comments below!